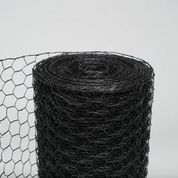 As the preferred deer and garden perimeter fencing, steel hex wire mesh offers easy installation to homeowners for managing wildlife and protecting your property. The wire mesh’s construction is resistant to animal chewing, digging and severe weather conditions. Steel hex wire mesh fence is manufactured of 20 gauge galvanized wire coated with a PVC coating for added endurance. The advanced PVC coatings make it nearly invisible and attaches to angle steel or heavy duty round ground posts. Today’s wire mesh hexagon design has a 20 -30 year life cycle as a defense for safeguarding large or small properties. 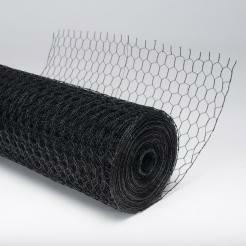 We offer strong hex wire fencing that you can add to your deer fencing for protection against small animals.